Search Awesome is an adware application that was created to make easy money for its developers. Adware programs are not malicious infectious, and it is not complicated to remove them from the affected systems. However, more of than not, users are not aware of the fact that they have these unwanted applications installed on their computers. So if they just let them be, there is always a chance that the application could end up being exploited by malevolent third parties that would eventually lead to certain computer security problems. As you can see, adware programs can be easily exploited by malevolent third parties, so do yourself a favor and terminate this app right now. It is very often that users are confused about adware programs. Sometimes it might be even hard to categorize them, too. That is because we usually imagine computer security threats as extremely dangerous programs that slither into the target system surreptitiously. However, Search Awesome and other similar programs often balance between a genuine software application and a potential security threat. It is especially hard to tell that a program could be potentially harmful if it has an official homepage. And, believe it or not, Search Awesome does have one. We have access the homepage for this application via searchawesome.net. Normally, when we open the official page for a specific program, we should find the program’s description and the direct download link. While we can find some scarce information about this application on the site, there is no direct download button that would allow us to install the program on our computer. So it is possible to say that this page is just an empty shell created to make Search Awesome look like a genuine program one can trust. However, just like it is with most adware applications, trusting it would be detrimental to your system’s security. Albeit the program does not seem to have a direct distribution source, it does not come out of nowhere. 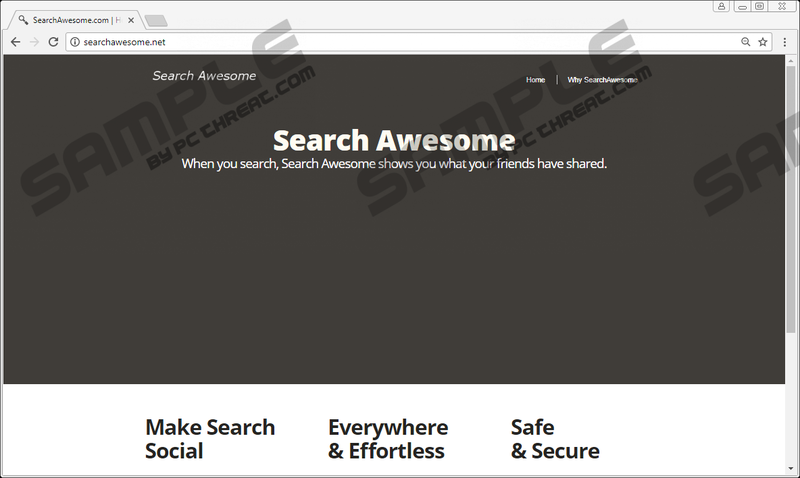 Search Awesome is a direct clone of Social2Search and Wajam. Both programs are rather notorious adware applications that have bothered multiple users throughout their run. They may also interfere with your web search settings, so it is obvious why you should not hesitate when it comes to remove Search Awesome from your system. While you are at it, you should also scan your system for other potential threats because the chances are this adware does not come alone. Just because this program does not have a direct distribution source, it does not mean it cannot reach your computer in some other way. After all, adware programs usually spread through software bundles. It means that Search Awesome must have arrived when you downloaded a freeware app from a file-sharing website. It could also mean that along with this one freeware app you downloaded, you must have installed several other undesirable programs, and Search Awesome was just one of them. How to avoid such mishaps? Well, reading the steps in the installation wizard should help you with that. If Search Awesome manages to enter your computer, you will soon notice that your Google search queries get redirected through searchpage.com to Yahoo! Search. This happens to users in the United States. If you are stationed anywhere else in the world, Search Awesome will add additional Google Ads on your page when you search the web. Needless to say, both behavioral patterns are really annoying, but they cannot cause much trouble unless you interact with them. In other words, if you stay away from the third-party content this program promotes, you should be able to avoid a number of security threats. Of course, the best way to avoid such problems is to remove Search Awesome at once. Fortunately, you can delete this program via Control Panel. This fact makes this adware program probably one of the easiest applications to deal with. On the other hand, after manual removal, you should still scan your system with the SpyHunter free scanner. As you already know, Search Awesome travels in software packages, so it means that you may have more unwanted programs on-board, and you need to uninstall them all. And the best way to do it is to employ a reliable antispyware application. Press Win+R and type Control Panel. Press OK.
Go to Uninstall a program and remove the program. Double-click Add or remove programs and delete the application. Quick & tested solution for Search Awesome removal.